23 year old female is bought to ED by her family after an intentional overdose of ~ 100 ‘diet tablets’ which she ingested 1.5-2 hours earlier. I was superficially involved in this case of a 32 year old suicidal patient who ingested two full packets of Solian (amisulpride) (~ 24 grams) approximately 90 minutes prior to arrival to ED. On initial assessment he was GCS 12/15 & had a systolic BP of 115 mmHg. Amisulpride – What is it ? a benzamide neuroleptic (atypical antipsychotic) with high affinity for the dopamine (specifically D2-2) receptor. unlike other neuroleptics, it has minimal affinity for 5HT, alpha, H1 or cholinergic receptors. < 8g = mild-moderate sedation, mild anticholinergic features. 8-15g = Increasing sedation & depressed level of consciousness. Cardiotoxicity includes hypotension, QRS & QT prolongation, bundle-branch blocks & torsades. Mild-Moderate: Mydriasis, lethargy, drowsiness and sedation, bradycardia, agitation, hyperthermia and extrapyramidal symptoms. Severe toxicity: Seizures, coma, hypotension, and QTc prolongation. Torsades & VT are reported in intentional overdose. Resuscitation area / full cardiorespiratory monitoring. Decontamination (oral activated charcoal) is recommended for > 4 grams in previous 4 hours. Chemical or electrical atrial overdrive pacing. 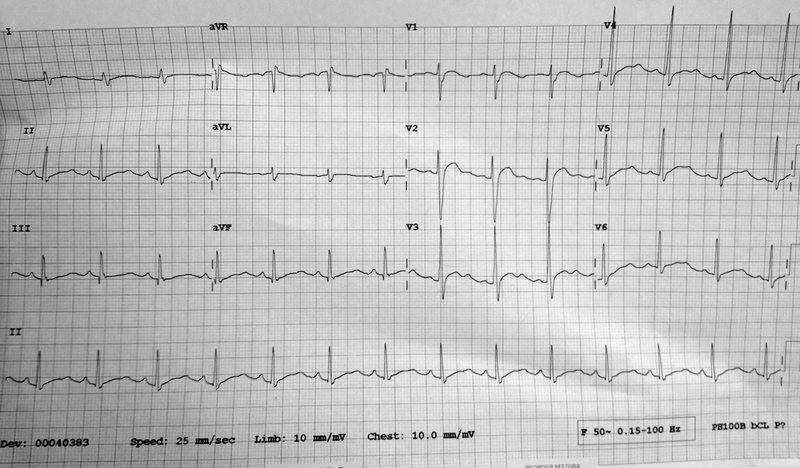 As a rule; all ingestions > 4 grams should be monitored for at least 16 hours and until all ECG intervals are normal…. Asymptomatic adults with inadvertent/minor exposure may be monitored at home. Significant/deliberate amisulpride overdose are observed for at least 16 hours after ingestion. Continuous cardiac monitoring and serial ECGs. If no dysrhythmias or QT prolongation at 16hrs –> discharged after psychiatric evaluation. Dysrhythmias or QT prolongation on ECG –> intensive care setting for continuous cardiac monitoring and treatment. ECG: Sinus rhythm @ 83bpm. Normal axis. PR ~200ms. QRS ~120ms. QTc ~560ms !!! He survived his first night in the ICU…. Murray L, Daly F, Little M & Cadogan M. Toxicology Handbook. 2nd Edition. Elsevier 2011. Isbister GK et al. Amisulpride deliberate self-poisoning causing severe cardiac toxicity including QT prolongation and torsades de pointes. Med J Aust 2006; 184 (7): 354-356. Isbister GK, Balit CR, Macleod D, Duffull SB. Amisulpride overdose is frequently associated with QT prolongation and torsades de pointes. J Clin Psychopharmacol. 2010 Aug;30(4):391-5.